I've taken a little break from the techie/social/blogging world over the past few weeks and frankly, I recommend it to everyone. Yes, the holidays have been busy and yes, I've been sick for several weeks and all of those factors have played into my lack of attention to my social world. I confess that I am often consumed by social media and it was nice to take a little break from it all. What can I say about 2011. There have been a lot of ups but also a lot of downs. I find myself relieved that it is over. My son is getting older, smarter, funnier and just when I think it isn't possible to love him any more, I find my heart completely consumed by him. There have been amazing weddings for my sister-in-law and one of my best friends. Babies have been born and I now have a new niece and nephew whom I love immensely. Some friendships have changed, others have flourished. Work has been busy and I have been able to work on exciting things in my field. I lost 20lbs this year and weigh the same as I did when I got married 6 years ago. Even though I lost 20 lbs I still have 40 to go to make it to goal. I expected to lose so much more this year. Yes, there were factors that were out of my control; however, I am in control of my own fate. Sometimes making lifetime at WeightWatchers feels like an insurmountable goal. A friendship changed. I'm pretty sure there is no way of changing it back. I don't understand why and it makes me insanely sad. I completely lost my ability to have another child. Christmas Eve. I have no idea how a day that is usually so iconic, fun and wonderful could turn into such a perfect disaster. I am still wrought with anxiety over it and am having a hard time of letting go that it wasn't a perfect day this year. All I can do is let it go and hope that 2012 holidays are better. You can plan things as meticulously as you want, but at the end of the day you have to be open to change, accept that things won't be perfect and let that be okay. Not to dwell on things you can't change. Accept things as they are and make the very best of them. A child makes everything magical. With every day I watch him grow, I know he completes me in every way. I. AM. SO. BLESSED. Not to take my career so seriously. Let's face it. At the end of the day, it is a means to an end and gives me the ability to do what I want for the people that matter to me most: my family. I am innately different now that I am a mom. I go to bed early. Drinking and partying isn't as much fun when you don't have the time or ability to recover from it with a greasy breakfast and a 4 hour afternoon nap. Not to give up. For the first time ever, I stuck with a New Years Resolution. I may not have met my weight loss goal; however, I have made drastic healthy lifestyle changes that will benefit me forever. No this is not a picture of me. 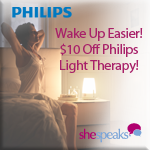 I was super stoked to FINALLY get accepted into the SheSpeaks Philips Wake-Up Light Better Mornings program. It is just a really cool product and might just be the answer to my prayers as a person who wakes up at 5am the majority of the week as well as suffers from SAD (Seasonal Appresive Disorder). Not sure how important daylight is? Sunlight and daylight have positive effects. They raise energy levels and help align our daily rhythm. 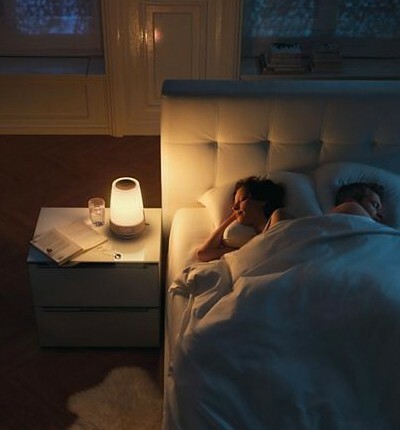 The Philip Wake-Up Light gradually wakes you up in a gentle, less abrupt way- the way nature intended. Starting a half hour before your set wake up time, the Philips Wake-Up Light gradually fills your room with bright light, similar to the rising sun. The light raises energy levels, slowly preparing you to slowly wake up. - That nothing would change and I would still be hitting snooze every 10 minutes. Night 1: This dumbass probably should've read the instructions fully as I was somehow blissfully unaware that you are to set it a half hour before you are ready to get up. Being a snooze button lover, I had set my clock to my "snooze" time: 5:05am (gives me about 30 minutes worth of snooze slamming). So to my limited knowledge, the light started firing up at 4:30am. At about 4:45a, I sensed that it was light (holy crap... this thing works??) and I panicked. Full on freaked. Shot up in bed thinking that it was about 7am and I was about to be very late for work. Worried that it worked so well on me (and it was much earlier than I am accustomed to anyway) and that I would wake up my snoring husband, I turned off the light portion and stuck to the good old fashioned FM radio wake up. Baby steps, right? I asked my husband if he noticed the light being on. He said no but that he heard the radio. LOL. Going into Night #2, I'm going to give this thing a REAL try. Set my alarm for 5:30 (light will start at 5) and see if waking up is a little easier without having to hit snooze a hundred times. Night 2: Yup. Got a kick from my husband this morning to turn the light off. However, can we agree that this thing works? The full intensity brighter than the sun light which woke my dear husband up. Yes, that is my backup former alarm clock in the background. And the video monitor. Also wonderfully bright for my husband's annoyance. Night 3: I knocked down the light intensity by half (to just a 5 out of 20) and it still woke me up about 10 minutes before the radio alarm sounded. Husband didn't wake from it this time; however, that may have been more because he was up at 4am with the kid. I am definitely feeling less apt to hit snooze- I actually want to just wake up and get moving! The intensity used at half and still more than woke me up. Night 5: Thanksgiving Turkey coma. Yet the light woke me up 10 minutes before my alarm as usual. Up and not entirely thrilled to be going to work the day after Thanksgiving. I spent a whole week testing out the Philips Wake-Up light and my final assessment? I love it. Love, love, LOVE IT. I love being woken up naturally rather than beating down my alarm clock every 10 minutes. In regards to my initial concerns, I found a light intensity that doesn't seem to disturb my husband, it actually does wake me up and I have yet to touch the snooze button. My biggest issue is lack of trust. As parents, we are often woken up in the middle of the night by our preschooler's dreams, potty needs, illness, monsters, MiMiMi scaring him (who the heck is MiMiMi?? ), ETC ETC ETC and are freaking tired. So tired, that often the sudden shrieking of an alarm clock is what it really takes to wake up before the crack of dawn. I don't trust that the light is going to wake me up, so I wake up every hour worried that I'm going to oversleep. Regardless of whether it worked just fine for an entire week and I woke up without an issue every day, I was still restless overnight. No lie, I was pretty skeptical. I didn't think it would work. I thought I wouldn't want it. I confess, I was wrong. This is a great product. If you struggle with getting up in the morning and are a chronic snooze smacker like I used to be, this product will do wonders for you. Thinking Light Therapy is the right thing for you? Click on the button to the left to get $10 off your Philips Wake-Up Light! * I was given a Philips Wake Up Light to review through www.shespeaks.com. All opinions are mine and mine alone.